What are the implications of the speed of light as a Universal constant? One of the most bewildering aspects of modern day physics is that of the speed of light as a Universal constant. In order to understand this it is necessary to first look at ordinary objects. Suppose that a train is moving past a station at 30 kmph and a man inside the train is walking towards the front of the train at 5 kmph. Then the speed of the man relative to an observer on the platform would be 30 kmph + 5 kmph or 35 kmph.! Similarly if instead of walking towards the front of the train he is walking towards the back of the train, then his speed would be 30 kmph - 5 kmph or 25 kmph. Note that his velocity relative to the train in which he is travelling remains at 5 kmph in either case! These calculations are known as Galilean transformations, they were the basic model used by Sir Isaac Newton to formulate his three laws of motion. Every time we drive on the highway, we encounter numerous examples of Galilean transformations. For instance take the example of two cars; car (a) at 60 kmph and car (b) at 30 kmph approaching each other from opposite directions at a distance of 10 Km. Their combined speed would be 60kmph + 30 kmph = 90 kmph. This can easily be verified by calculating at what point the two cars would meet if they maintain the same constant speeds. Since the distance between them is 10 Km, it will take 10/90 = 0.111 hours for the two cars(a) and (b) to meet. During this time Car (s) would have travelled 3.33 Km and car (a) would have traveled = 6.6666 Km Thus the time taken for the two cars meet is the time calculated according to their combined velocities 60 kmph and 30 kmph = 90 kmph. The same kind of relationship holds true in general for any two bodies moving with respect to each other. If two people (a) and (b) are walking towards each other from an initial starting distance of 1 km and their speeds respectively are 5 kmph and 3 kmph, then their speed with respect to each other is 8 kmph and to verify this it is found that if they continue to maintain these same speeds that they will meet after 7.5 minutes, during this time (a) would have travelled 0.625 Km, and (b) would have travelled 0.375 Km. making a total of 1 Km. These transformation laws of classical mechanics are common-sense. . In fact Galileo went so far as to state that if the laws of mechanics are valid in any one frame of reference, they are also valid in any other frame of reference moving relatively to it. The only catch with this statement is that no-one has as yet succeeded in identifying such a fixed frame of reference, although of course the sun and the stars would serve this purpose. As the nineteenth Century progressed and physicists were able to measure the speed of light with ever increasing accuracy and they were surprised to learn that the speed of light was a constant. In other words it did not follow the Galilean laws of transformation that other phenomena exhibited. That is, if two beams of light were approaching each other they would not follow Galilean transformations and have a combined speed of 600,000 km per second but each beam of light would have a constant speed of 300,000 km per second. This means that if they were 300,000 km apart, they would meet after 0.5 seconds and not after 0.25 seconds as would have been the case had Galilean transformations held good. This was extremely puzzling, Maxwell and Faraday, had only recently shown that electromagnetic waves also possessed the same velocity as the speed of light and that their means of propagation was through self sustaining electric and magnetic fields. This was outside anyone's experience. How could such a thing be possible? More important was the question what could be the reason for such seemingly impossible phenomena to take place ? The problem of the speed of light as constant in a vacuum, taxed the minds of physicists for several years until an Irish physicist named George Fitzgerald came up with the idea that the only way in which Light could ignore Galilean transformations was if time itself lengthened or shortened during the period of its travel, he also brought up the idea of objects getting fore-shortened as they neared the speed of light or lengthened as they moved away. Henri Lorentz, probably one of the most gifted Physicists and mathematicians of the time, came across George Fitzgerald's ideas and put them into the Mathematical form that are known today as the Lorentz transformations. Re: The speed of light as a Universal constant. A brilliant young German scientist by the name of Albert Einstein came across the work of Henri Lorentz and became fascinated with the problem of the speed of light as constant. He concluded that space “contracts” and time “dilates” (or slows). Some of the motion through space can be thought of as being "diverted" into motion through time (and vice versa), in much the same way as a car travelling north-west diverts some of its northwards motion towards the west. Thus, the dimensions of space and time affect each other, and both space and time are therefore relative concepts, with only the unvarying speed of light providing the bedrock on which the universe is built. This revolutionary idea flew in the face of the long-held notion of simultaneity (the idea that events that appear to happen at the same time for one person should appear to happen at the same time for everyone in the universe) and suggested that it was impossible to say in an absolute sense whether two events occurred at the same time if those events were separated in space. In a nutshell, the Special Theory of Relativity tells us that a moving object measures shorter in its direction of motion as its velocity increases until, at the speed of light, it disappears. It also tells us that moving clocks run more slowly as their velocity increases until, at the speed of light, they stop running altogether and that the mass of a moving object measures more as its velocity increases until, at the speed of light, it becomes infinite. Einstein also realized that Maxwell’s equations led to an apparent paradox or inconsistency in the laws of physics, because it suggested that if one could catch up to a beam of light one would see a stationary electromagnetic wave, which is an impossibility. Einstein hypothesized, therefore, that the speed of light actually plays the role of infinite speed in our universe, and that in fact nothing can ever travel faster than light (and certainly that nothing in the universe could ever travel at anything like infinite speed). It should be noted that Einstein did not actually PROVE the constancy of the speed of light in all frames of reference. Rather, it is an axiom (an underlying assumption) from which he derived the rest of his theory. The axiom can be experimentally verified, but it is not proven in any theoretic sense. The constant speed of light was to become one of the two main planks of his Special Theory of Relativity. The other main plank was the "principle of relativity" (or "principle of invariance"), an idea first stated by the great Italian physicist Galileo Galilei as early as 1632. Galileo argued that the mechanical laws of physics are the same for every inertial observer (those moving uniformly with constant speed in a straight line), and therefore that, purely by observing the outcome of mechanical experiments, one cannot distinguish a state of rest from a state of constant velocity. When Einstein combined the principle of relativity with the constant speed of light, it became clear to Einstein that the speed of light was also independent of the speed of the observer (as well as of the speed of the source of the light), and that everyone in the universe, no matter how fast they were moving, would always measure the speed of light at exactly the same 300,000 km/s. Essentially, then, the Special Theory of Relativity can be boiled down to its two main postulates: firstly, that physical laws have the same mathematical form when expressed in any inertial system(so that all motion, and the forces that result from it, is relative); and secondly that the speed of light is independent of the motion of its source and of the observer, and so it is NOT relative to anything else and will always have the same value when measured by observers moving with constant velocity with respect to each other. Much of modern physics is based on the assumptions made by Albert Einstein and believes implicitly in them. However, even though Albert Einstein was never able to give the reason for the speed of light being constant, there does in fact exist a possible reason for the speed of light being a constant and IF true would over-turn special relativity and General relativity as well as many of the assumptions of Quantum Mechanics, notably the principle of wave/particle duality which, like gravity and like the speed of light in a vacuum as constant, has never been given a satisfactory explanation. The explanation for the speed of light being constant that I refer to is the existence of a medium, yes the much touted aether ! The reason is simple, against all commonsense, it appears that energy, waves, travelling through a medium, always move at the maximum speed allowed by that medium. That's all there is to it. Why wasn't this objection raised by physicists, when Einstein put forward his theory of time dilation and space contraction to explain the speed of light as a constant? After all most of the physicists of the time were expert in wave theory. The problem was that it had already been proven that electromagnetic radiation, including light, travelled as a transverse wave. A transverse wave unlike a longitudinal wave requires an extremely stiff material through which to propagate. Thus if an aether did exist it would have to be extremely stiff in order to accommodate transverse waves, there was simply no getting around this objection. (incidentally some morons continue to voice the same objections today!). As a corollary to this objection was the extremely obvious fact that if it was such a stiff medium it HAD to be detectable by some means or the other. there was no way in which such a stiff and unyielding medium ( as the aether was thought then to be) could possibly continue undetected. This being the case when first Maxwell, with his fascinatingly brilliant theory on the propagation of light and electromagnetic radiation and later Einstein with his plausible ideas about time dilation and space contraction, both asserted that the aether was absolutely obsolete when it came to the propagation of light. Physicists were only too happy to believe him. The Michelson Morley experiment proving conculively that the aether did not exist was the final blow to the theory of an aether. Whether they were justified in doing so, is with hindsight, highly unlikely. But even if an aether was no longer needed, it still left the problem of WHY the speed of light was constant. Einstein solved the problem by simply stating that the speed of light was a Universal constant and that whichever frame of reference was used, the speed of light was constant. He also made light the ultimate velocity in the Universe, nothing could move faster than light. Thus instead of the aether being the frame of reference through which everything else could be calculated, it was the speed of light that took that distinction. It is common knowledge that a material object can move with any velocity, and can be sped up or slowed down by a force that increases or decreases its kinetic energy. For instance if a stone is thrown with a certain velocity in space, it will continue to travel with that velocity forever, until it meets an object that will slow it down or stop it. But this property does not apply to waves. The speed with which a wave moves is solely determined by the medium through which it moves. Once a wave is created, the only reason its speed will change is if it enters a different medium or if the properties of the medium change. Water waves travel more quickly over deeper water, so a wave will slow down as it passes over an underwater ridge, but speed up again as it emerges into deeper water. The wave's speed depends only on the medium. Adding energy to the wave doesn't speed it up, it just increases its amplitude. A water wave, unlike many other types of wave, has a speed that also depends on its shape: a broader wave moves faster. A wave can be described as a disturbance that travels through a medium from one location to another location. When a wave is present in a medium, the individual particles of the medium are only temporarily displaced from their rest position. 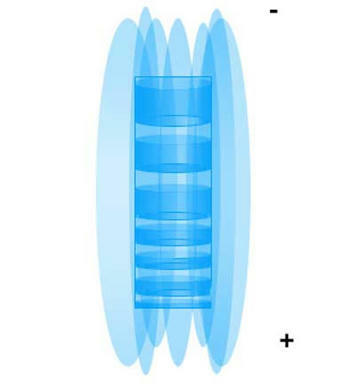 As a disturbance moves through a medium from one particle to its adjacent particle, energy is being transported from one end of the medium to the other. In a water wave energy is transported through the medium, yet the water molecules are not transported. The same holds true with sound waves travelling through air. Waves traveling through the bulk of a fluid (such as a liquid or a gas) are almost always longitudinal waves. Transverse waves require a relatively rigid medium in order to transmit their energy. As one particle begins to move it must be able to exert a pull on its nearest neighbor. If the medium is not rigid as is the case with fluids, the particles will slide past each other. This sliding action which is characteristic of liquids and gases prevents one particle from displacing its neighbor in a direction perpendicular to the energy transport. One of the main reasons that Einstein's theory of special relativity and later his theory of General relativity, escaped with little criticism or objections from physicists and succeeded in gaining wide-spread acceptance was that the findings of Max Planck that light existed as discrete packets of energy or Quanta, had completely eluded the public consciousness and even though Max Planck had won the Nobel prize for his findings, his theory received little credibility with the public and most physicists, it was thought to be an aberration far from main stream physics. Ironically the lack of an aether was also the reason that the principle of wave/particle duality gained such a paramount importance in quantum mechanics. If the question is asked whether an aether could serve as a medium through which light could propagate. The answer is a resounding yes. When one is formulating a new theory, the accepted theory is first tried out, if that is found to be wanting, further investigations using new ideas and criteria are made. In the case of the aether, such investigations were not carried out, such was the overweening confidence of physicists in the Quantum mechanics solution that the only references made to the aether were ones of absolute derision bordering on contempt that such a concept could ever have existed. But first would the existence of a medium through which light could propagate solve the problem of the speed of light as a constant. Indisputably ! Suppose that a car is driving along the highway at 70 Km per hour and a truck is approaching from the opposite direction at 60 Km/hr then the combined speed would be 130Km/hr, similarly if another car moving in the same direction overtakes at 100 km/hr then the relative speed of the car would be 100-70 = 30 Km/hr. However if the truck as it approaches is moving at 60 Km/hr and it is blowing its horn, the speed of sound, provided the medium doesn't change, would remain the same (say 340 m/s)at whatever speed it moves in that medium irrespective of the speed of the truck or of the observer. Of course exactly the same phenomena applies to light, since we cannot detect a medium it is much more mystifying than sound, where the medium is easy to detect. Sound simply cannot travel through the air faster than the speed of sound in air at those conditions. No matter how fast the vehicle moves, the sound will always move away as fast as it can in the medium. Sound speed is a property of the medium. Sound is not an object, but a disturbance in a given medium, so it will always travel at the rate the medium prescribes. Thus if an aether does exist it would solve the huge mystery of why the speed of light is a constant. that the laws of conservation of energy are not disturbed. GAT holds that it is these interactions that result in the force of gravity. Thus the aether moves through matter and matter moves through aether and the result is gravity ! Thus a picture of the aether begins to emerge, as something that fills the entire Universe and probably had its conception at the time of the Big Bang or close to it, coming into its final form at the end of the inflationary era of the Big Bang. Thus, apart from their energies, there is no difference between a 'virtual photon' of which the aether is comprised and that occupies the entire universe and a real photon that is emitted by an electron. The picture that begins to emerge is of a Universe filled with extremely small extremely low energy dipoles that take the form of solitons ( waves in the form of packets of energy) that are extremely sensitive to any real photons OR extremely short lived but energetic photons. Thus when a real photon is emitted by an electron into the aether, the 'virtual photons' of the aether, line up in the direction of propagation of the real photon, forming a line whose ends rest on infinity. The energy of the real photon travels along this line of aligned 'virtual photons'. The first proof of the GAT (Gestalt Aether Theory) claims that the long cherished belief that it is the electron that is the fundamental charge carrier is false. Instead GAT claims that the fundamental charge carrier is the photon, and presents mathematical and written evidence in support of this claim. Surely this is an important enough assertion to deserve attention, especially since it is a well documented and observed fact that in every other interaction that involves electrons and energy exchange it is photons that are the mediators. By introducing the concept of the photon as the fundamental charge carrier, the propagation of electricity is brought into line with all other observed phenomena involving electrons and energy exchange. GAT Theory claims that radio waves, just like visible light are also due to photon emission and thus brings into line the two phenomena, which apart from radio waves having massive (comparatively) wave lengths, share all other properties in common. Please do read and evaluate. Notice that there is a single causative factor for both visible light and radio waves, although implemented differently. The third proof of the GAT puts forward the claim that light is finite, it does not travel for ever, as is assumed by Quantum Mechanics and modern physics and that the propagation of incoherent light follows the inverse square law. It is asserted that the validity of this claim can be proven through experiment and mathematical calculations. The fourth proof of the GAT (gestalt Aether Theory) examines the modern day theory of scattering and reflection of light and finds that it may be in error. A claim is made that light is composed of lines of photons and that these lines of photons travel in straight lines. (a la Newton). The Fifth Proof of the GAT Gestalt Aether Theory deals with the mechanism governing reflection in any type of medium. More proofs of the Gestalt Aether Theory will be posted at regular intervals. The entropy of the surface of an event horizon is directly proportional to the square of the Planck length. Therefore the speed of light being the displacement of one Planck length in one Planck time follows naturally from both the black hole entropy and the holographic principle. No need to invoke an aether. ...., if two beams of light were approaching each other they would not follow Galilean transformations and have a combined speed of 600,000 km per second but each beam of light would have a constant speed of 300,000 km per second. First of all special relativity (SR) states that the speed of light is invariant meaning that if you change your frame of reference then its value will not change. When someone says that the speed of something is constant then its meant that it won't change in time or place. However invariance of c implies the constancy of c.
Depending on what you mean you could be wrong. If you mean that if, in the inertial frame S, a beam of light was moving from along the x-axis in the positive direction with speed c and another beam was moving along the same x-axis in the negative direction with speed c then their relative speed of the two beams is 2c. What SR states is that that will be the same in any inertial frame of reference. Also what SR states is that there is no frame of reference in which the speed of light is c.
That's because you have a misunderstanding of the invariance of c postulates of relativity. Maxwell and Faraday, had only recently shown that electromagnetic waves also possessed the same velocity as the speed of light and that their means of propagation was through self sustaining electric and magnetic fields. Electromagnetic waves were not known to have that property. This was outside anyone's experience. How could such a thing be possible? Once you fully understand these principles and results fully then the invariance of the speed of light is easy to understand. More important was the question what could be the reason for such seemingly impossible phenomena to take place ? Are you familiar with how the term reason is defined within the context of practical logic? If not then here's the formal definition from the text Practical Logic: An Antidote for Uncritical Thinking by Douglas J. Soccio and Vincent E. Barry, pages 460. Reason - the capacity to draw conclusions based on evidence. Argument: any group of propositions (truth claims/axioms), one of which is claimed to follow from the others. I just wanted to get these definitions out of the way in case those reading this post are not familiar with the terminology. What Fitzgerald did was to provide a way to arrive at Lorentz contraction. However his reasoning was shown to be wrong by Einstein. Where do you ever get this impressions from? It's well known by physicists that Faraday never knew of such a thing. That was due to Maxwell only. Maxwell published A Dynamical Theory of the Electromagnetic Field in 1865. It was in this publication that he demonstrated that electric and magnetic fields travel through space as waves moving at the speed of light. Faraday had nothing to do with it. In fact at that time Maxwell was not able to form a close relationship with Faraday who was showing signs of senility at that time. It is doubtful that the beautiful equations created by Maxwell would have ever existed if not for Faraday. Thank you for increasing my concept of the term reason. However, while we are on the subject of reason would you be so kind as to tell me ( in the absence of a medium) what reason Albert Einstein gave for the speed of light being constant in a vacuum. As I recall he admitted his inability to explain why the speed of light in a vacuum was constant, he just stated that it was a Universal constant. Einstein would have been the first to accept that nothing in science, especially a science built on such shaky foundations is immutable. Incidentally it was Fitzgerald who came up with the theory first, in 1889, Lorentz came to the same concllusion independently in 1892. Length contraction was postulated by George FitzGerald (1889) and Hendrik Antoon Lorentz (1892) to explain the negative outcome of the Michelson-Morley experiment and to rescue the hypothesis of the stationary aether. When are you going to apologise for the blatant plagiarism? Re: What are the implications of the speed of light as a Universal constant? where h is Planck's constant. The operative word here is 'only', electromagnetic radiation can only be emitted in quantised form. This being so how is it possible to speak of reflection as the interaction of an atom with an electromagnetic 'wave'. Such a conception is totally false. The true state of affairs is that in the phenomenon of reflection light quanta or photons are absorbed and re-emitted. This is a fundamental aspect of electromagnetic radiation that is needed to be understood and it is a path breaking moment because it sheds a whole new light on how electrons and photons interact and also shows that frequency of a photon is not a purely abstract formulation but possesses a very real intrinsic meaning. For instance if you are looking out onto the garden and see a green lawn, what the eye is seeing is trillions and trillions of atoms that are absorbing and re-emitting light of a wave-length of 550 nm and a frequency of 600 THz. What this means is that each electron is absorbing and emitting photons at the rate of 600 THz or 6 x 10 14 photons per second! Of course this is not the whole story some of the incident light might be absorbed resulting in release of energy in the form of heat, some photons might pass through the atom without interaction. The point is that even very modern up to date physics text books speak of the phenomenon of reflection being due to the excitation of the electron by an electromagnetic wave of that particular frequency, this is a very inaccurate explanation of what really takes place in reflection. NOT only does quantum mechanics hold that this is true of reflection BUT it also states that the same principle applies to the propagation of an electric current in a circuit, electrons communicate and transfer energy through an electromagnetic wave or field ! But this is a digression, in trying to understand planck's constant, it is necessary to understand something about the man Max Planck and about the physicist Max Planck. He was above all extremely conservative. For instance he had a deep seated distrust of statisticians, why ? Because statistics is of necessity not an exact science, it yields a blurred estimate of what the answer might be, which will be close but not exact. Planck felt that physics was an exact science and that it should yield exact results. Apart from being extremely conservative in his outlook he was also exceedingly particular about the standards of his investigations, he was absolutely meticulous about his results. Which is why when during the investigation of Black Body radiation he continually came up with results that did not seem to make sense, he refused to believe what his results indicated. Eventually in spite of his distrust of statisticians he took his problem to Boltzman who advised him that one possibility was that the radiant energy was not delivered continuously but in discrete amounts. When he used a statistical formula to calculate his results he found that this was indeed the case and was a complete explanation of the phenomenon he was witnessing in his investigation of black body radiation. Even many years after he had received recognition for his work, Planck continued to believe that the formula he had worked out was a purely formal assumption. (n.b., this is very similar to the manner in which modern day physicists view reflection or an electric current). It took him years to finally come to terms with the implications of his discovery. I relate this anecdote, not so much to illustrate how the concept of quanta ( photons) came into being as to demonstrate how absolutely sincere Max Planck was, there was nothing of the charlatan about him. There is no possibility that anything underhand went into the discovery of quanta, it was pure, hard slogging mind numbing research at the highest level. The anecdote also illustrates why the common public could not come to terms with quanta, if a physicist of the stature of Max Planck has such a tough time coming to terms with quanta, what chance did the layman have of coming to terms with it ? But even for those physicists who did believe in quanta, which when applied to light can be taken as photons, the problems were almost insurmountable. For instance a wave, which is what everyone had believed electromagnetic radiation to be until that time, delivers its energy continuously, while quanta delivers energy in discrete amounts. For those who think it is an easy affair to impose discrete energy packets on a wave form. Think again, it is almost impossible. The electron is present as a cloud. Averaged over the cloud, the positive kinetic energy is half as big as the negative potential energy. More importantly, the cloud really is the state of the electron. It's not a picture of where some dot-like particle probably is. It isn't anywhere in particular. It also doesn't have any particular velocity. In a hydrogen atom, it's certainly not going in a circle. The cloud doesn't go anywhere at all. There's no reason for it to radiate. The world at a small scale cannot be put together out of anything like the pictures we're used to at a large scale. Today even though we are aware that 'virtual photons' exist and even though it has been proven through experiment that electrons are able to maintain their equilibrium around the nucleus through emission and absorption of 'virtual photons' . Wave/particle duality is still the strongest axiom of quantum mechanics and the model of the electron around the nucleus being wave like has undergone no modification. Yet and this is the truly disturbing aspect, quantum electrodynamics states that electromagnetic radiation propagates using a very similar mechanism involving 'virtual particles' called 'quantum entanglement', a real photon is emitted (by the transmitting aerial ?) and spontaneously disintegrates giving rise to an electron and a positron which undergo annihilation during which process a photon is created with the same characteristics of the original photon and this, according to QED is how electromagnetic radiation is propagated! I hope that the picture is getting clear of how so many eminent physicists were able to accept Albert Einstein's remarkable statement that there was no need for an aether, provided the concept of a fixed time or space was abandoned ? More thoughts to follow. Who are you speaking to and what is being plagiarized? McQueen. In new theories in his post on the first proof of the Gestalt Aether Theory he wholesale copied an answer from physicsforum.com with equations in showing why free photons cannot emit or absorb photons. He did not cite the source but tried to pass it off as his own. I was almost fooled and was quite impressed with what I thought was his own work. I then found an almost identical post on physicsforum.com. Except McQueen had botched one of the equations that had been copied. That is what put me onto it. If you are going to state a 'new theory' then by all means use other peoples work to back up your case. First though understand it and definitely cite it. Ok McQueen let's give you the benefit of the doubt. What is the value of the Planck constant in Hz? Why should it be considered to be this value? I am aware that the naked scientists forum has a strict anti-flaming policy. It is a pity that that policy does not extend to heckling and stalking ! I asked you a pretty straightforward question about the Planck constant. I would say you used it to back up your argument but that was lifted from a post elsewhere. You should at least know the reason for a constant of proportionality if you are using it to back up your work. If you don't understand the values you are using then doubt must be thrown upon everything you say. As pointed out during the post, the ideal form for the aether, always supposing that such an aether exists, would be if it were an electromagnetic one. In this thread we have attempted to show how light can have electromagnetic properties by connecting up from the tiniest sub-atomic causes, to the biggest conceivable cosmic cataclysmic event of the Big Bang. Gestalt Theory of the aether suggests that since the electron is the fundamental unit of charge in nature and is a charged particle. The manner in which it regulates its energy is by emitting small bursts of electrical energy. These bursts of electrical energy are not emitted in one go but in small bursts of energy. See pic. What could be more natural than that the electron, a charged particle , regulates its energy by emitting and absorbing burst of electrical charge ? Furthermore since these small bursts of electrical energy emitted by the electron are separated by small distances from each other and probably have differing strengths , with the strongest discharges being emitted first and the weaker ones subsequently, a natural consequence of this might be that the bursts of electrical energy emitted by the electron become polarized, with the result that an electromagnetic field takes shape around them forming a solenoid, making them electrically neutral. Further this is also the exact physical form that a ‘virtual photon’ of the virtual photon aether might take, as can be seen it is identical to a ‘real photon’ except that it has vanishingly small energy. Thus if an aether as described here exists it is an electromagnetic aether, consisting of innumerable more or less fixed dipoles that are free to orientate themselves in 360 degrees and that permeate every last bit of the Universe. Such an aether would be electrically neutral, it would be massless , odourless, impossible to detect, would travel through matter as easily as if matter did not exists, since no electrons would be able to interact with photons of such low energies. Yet at the same time, far from being the static aether of the 18th and 19th Century, it would be a highly dynamic aether, that was sensitive to the slightest change in energy and could line up in the direction of propagation of a real photon or even that of a ‘virtual photon’ giving a ephemeral tug that constitutes gravity. This is why the speed of light is constant. It is time to give some serious thought as to whether De Broglie's hypotheses is in fact justified: According to De Broglie a moving particle is always associated with a matter wave. What is significant in the De Broglie equation is that it comes down to comparing apples and oranges. The De Broglie equation tries to compare two completely differing forms of matter namely; solids and waves. The two are different and have different properties they cannot be compared using the same equations. This shows that the velocity of a matter wave (De Broglie wave) is always faster than the speed of light further it shows that the velocity of the De Broglie wave is not constant, it depends on the velocity of its associated particle, the matter wave is a wave of probability. The De Broglie relation states that the greater the mass of the particle the shorter its associated De Broglie wavelength and the smaller the mass of a particle the longer its wave length, similarly the faster a particle is travelling the shorter its wave length and vice versa. In 1927, Clinton J. Davisson and Lester H. Germer shot electron particles onto a nickel crystal. What they saw was the diffraction of the electron similar to waves diffraction against crystals (x-rays). In the same year, an English physicist, George P. Thomson fired electrons towards thin metal foil providing him with the same results as Davisson and Germer. This seemed to be the supporting proof that the de Broglie hypotheses needed. Yet it leaves a lot to be desired. Water is made up of molecules, yet waves in water display diffraction, the same applies to sound waves in air, neither of these phenomena, although they involve sub-atomic particles, have need of De Broglie waves. The answer is amazing. The velocity of the De Broglie wave is 1.7 x 1014 m/sec. That is the De Broglie wave is moving at more than a million times the speed of light. One can possibly account for a 'phase' wave that is moving at three, four or even five times the speed of light but a million times the speed of light ? According to Broglie it is a 'fictional ' wave or phase wave that cannot convey information. Yet we are told in all seriousness that this is indeed the phenomena that is responsible for the wave like effects demonstrated by sub-atomic particle, atoms and even molecules. How can a 'fictional' wave that cannot convey information, be responsible for a very tangible physical phenomena like diffraction ? The answer is that it can't, It doesn't make sense. Obviously at the point in time when the De Broglie hypotheses was accepted at face value, physicists were bending over backward in order to try and account for the fact that a particle ( the electron) was accelerating around the nucleus without radiating away all of its energy and spiraling into the nucleus. In order to make sense of the second contradiction in De Broglie waves, it is necessary to understand a little bit more about waves, the manner in which they propagate and what relation they have to phase waves. It is common knowledge that a material object can move with any velocity, and can be sped up or slowed down by a force that increases or decreases its kinetic energy. For instance if a stone is thrown with a certain velocity in space, it will continue to travel with that velocity , until it meets an object that will slow it down or stop it. If that stone is again impelled forward in the same direction by some force, it will experience a corresponding acceleration and a change in velocity. A wave can be described as a disturbance that travels through a medium from one location to another location. When a wave is present in a medium, the individual particles of the medium are only temporarily displaced from their rest position. 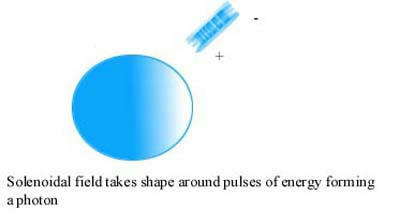 As a disturbance moves through a medium from one particle to its adjacent particle, energy is being transported from one end of the medium to the other. In a water wave energy is transported through the medium, yet the water molecules are not transported. The same holds true with sound waves travelling through air. Waves traveling through the bulk of a fluid (such as a liquid or a gas) are almost always longitudinal waves. Transverse waves require a relatively rigid medium in order to transmit their energy. As one particle begins to move it must be able to exert a pull on its nearest neighbor. If the medium is not rigid as is the case with fluids, the particles will slide past each other. This sliding action which is characteristic of liquids and gases prevents one particle from displacing its neighbor in a direction perpendicular to the energy transport. Hence transverse waves cannot propagate in liquids or gases. This being so how is it that De Broglie waves can have varying velocities. The De Broglie hypotheses seems to be an absolutely pointless exercise, although so much has been construed from it. It seems to have been the last recourse of physicists at the end of their tether. Page created in 0.212 seconds with 69 queries.